Students need to be aware of social causes and their importance. India, as a society is very diverse. And this brings about a lot of social challenges. Sensitising students at an early age about these issues and making them participate will only help them grow into understanding, accepting and humane individuals. Hence our Social Cell works towards few social causes that need the participation of students and the future of a better tomorrow. It’s been the tradition of our management and college to always support a good cause. Since our Trustees’ believes that social work is a discipline that seeks to improve the quality of life and subjective well being of individuals, families and communities as well. So keeping up with our tradition, the college has been organizing Blood Donation Camp and this year also the college held its 6th camp was held in association with the NSS Unit of College on 15th December, 2015. This year also we received the same support from friends, families, students, teaching as well as non-teaching staff, the way we received in previous years. 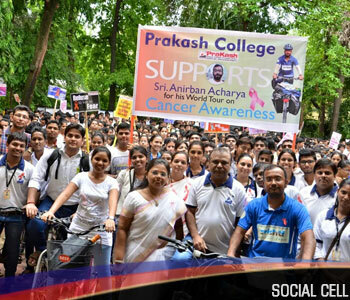 In support of the initiative of the “World Cycle Tour” on Cancer Awareness, embarked by Reverend Sir – Mr. Anirban Archarya- a social worker by passion and also a firm pillar of Bosepukar Shrishti Welfare Foundation, which works mainly for creating Awareness Campaigns & Medical Treatments of Life Threatening Diseases: CANCER, Prakash Degree College (Kandivli west) also initiated by proceeding an awareness rally accompanying him from Poinsar Bus Depot to Prakash Degree College with the noble intension of creating awareness among the local masses. The cancer awareness rally began vibrantly and showcased the value of prevention of cancer on the streets. The College Management along with Dr. Disha Gandhi studded the task of Anirban Archarya’s exhilaration. The Prakash Family along with the Students, contributed generously in filling up the pond of Anirban’s mission. The day ended up with enormous merriment and contentment making the social event a grand success.